Spark your kids’ imaginations and go on adventures at home! 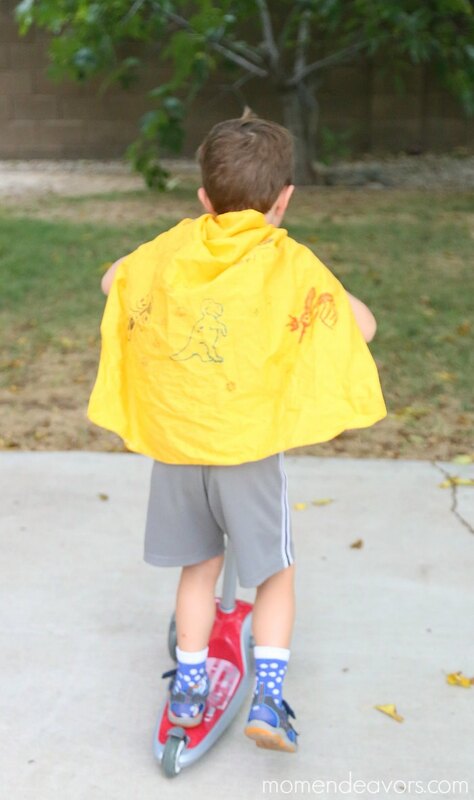 We’re so excited to share this fun “choose an adventure” activity jar idea with you today as part of a sponsored partnership with Radio Flyer. 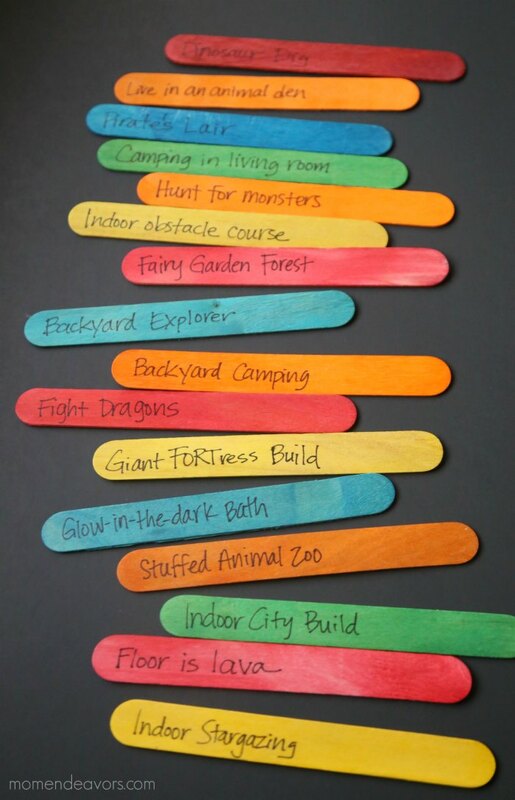 Dinosaur Dig, Live in an Animal Den, Pirate’s Lair, Camping in the Living Room, Hunt for Monsters, Indoor Obstacle Course, Fairy Garden Forest, Backyard Explorer, Backyard Camping, Fight Dragons, Giant FORTress Build, Glow-in-the-Dark Bath, Stuffed Animal Zoo, Indoor City Build, Floor is Lava, Indoor Stargazing. Fun, right?! 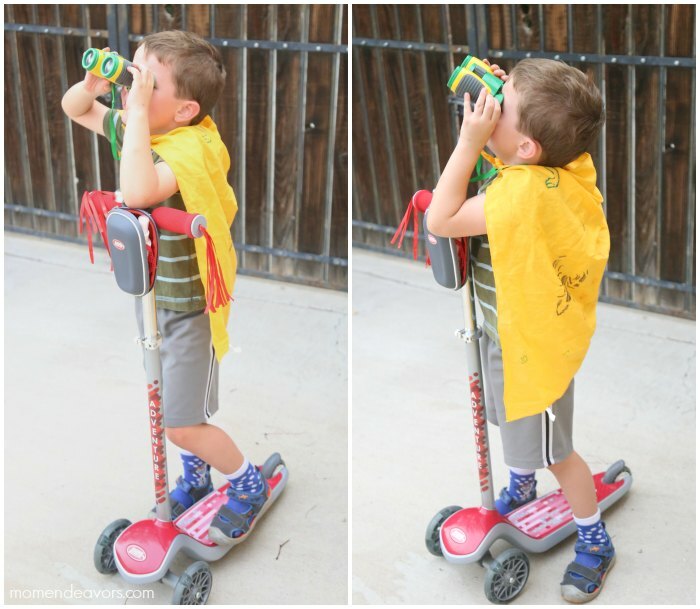 These at-home adventures fit right in line with Radio Flyer‘s Travel Agency just for kids, created as part of their 100th anniversary celebration! Just check out this super adorable video!!! 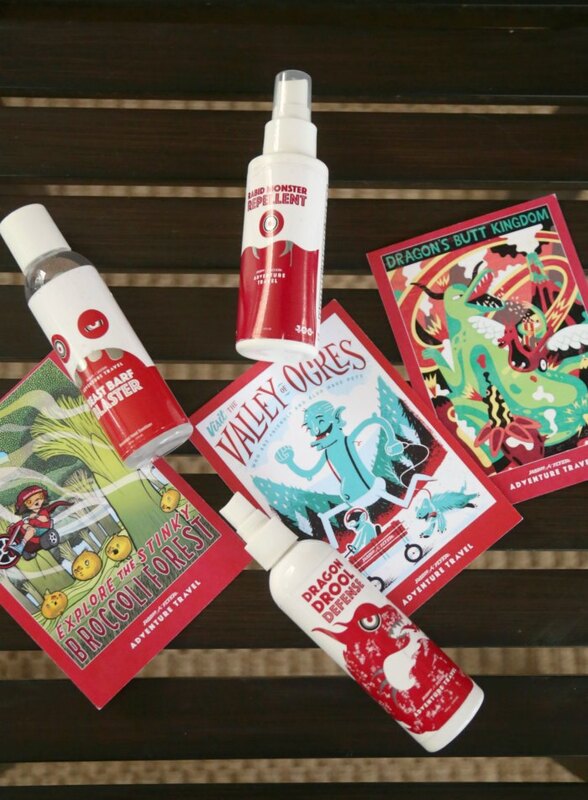 He had some fun postcards from far off destinations and was armed with some fun protection from Radio Flyer like Dragon Drool Defense (sunscreen spray), Rabid Monster Repellant (insect repellant), and Beast Barf Blaster (hand sanitizer)! SO fun! So, are you ready for your own imagination adventures at home? 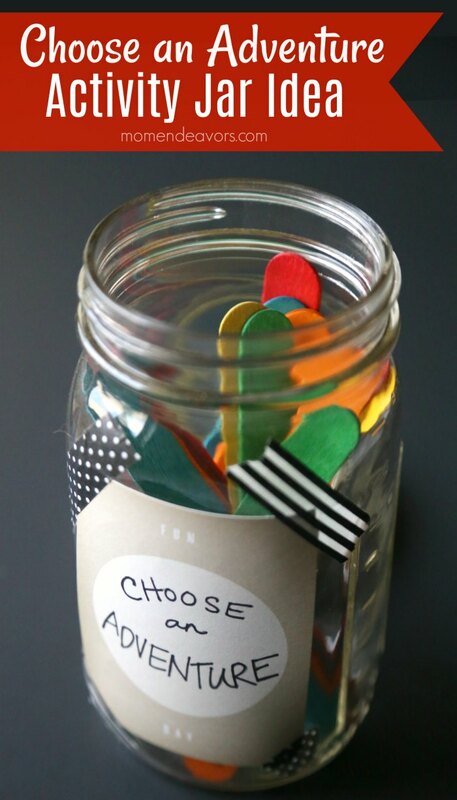 Grab a jar, get creative with some activities, and label some sticks! For an added bonus to help your adventures, Radio Flyer has offered up a GIVEAWAY! Radio Flyer 100 Years GIVEAWAY! Share stories of your summer adventures both past and present using #radioflyer100 to be entered (through the form below) and one lucky Mom Endeavors will win a $100 Radio Flyer gift card!!! SO fun! Giveaway is open to US Residents, 18 and older. Use the form below to enter for your chance to win through Monday, August 14th! Good luck and happy adventuring!!! What a fun project to help keep the kids busy! I love all the Radio Flyer products and how they really are built to grow with your children. Currently, I’m eying the CLASSIC RED 12″ CRUISER for little sister’s first big girl bike! Hands down the Luke Landspeeder. Though I love all the wagons and ride ones. The balance bikes are super cool and retro too! What a fun project and great giveaway!! I like the tesla s.
I’d love to get the Deluxe Grandstand Wagon 3-in-1. First thing that I saw is what I would love to get for my nephew. The Luke Skywalkers Landspeeder is on my Christmas check list. Thanks for sharing. I would love to get my nephew one of the build a balance bikes! He would love it! I’m sorry I wrote that on the wrong thing! We are doing this craft this week to keep us going on adventures!! I like the Ziggle on the Radio Flyer website. I like the Tesla Model S, awesome! My favorite product is the ALL-TERRAIN CARGO WAGON…..heavy duty is good! 🙂 Thank you. The Luke Skywalker’s Landspeeder is awesome! I can’t believe Radio Flyer makes that! I like Like Skywalker’s Landspeeder. I like the Big Red Classic ATW. I like the build a balance bike for our son. I would love to have the BUILD-A-HORSE. Ohhh that’s a hard choice to pick just one favorite! I really want to play with everything on their site. Errr, I mean my kids would hehe. We actually recently moved halfway across the US and had to do some major downsizing including one very loved Radio Flyer Pink Tricycle so I would def choose that as my LO’s fave! I personally think the Flyer 500 looks like a ton of fun! I like the classic red wagon- reminds me of my youth! I have to admit, I didn’t realize how many products radio flyer has now!! 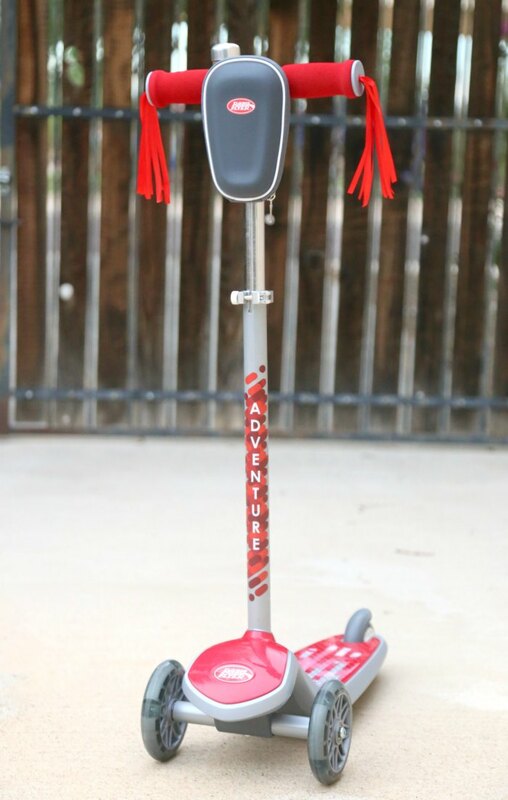 We own the radio flyer scoot to pedal and one of the trikes and they are really awesome especially in terms of quality! These are strong toys that can be passed from family to family for a number of kids to enjoy over the years!! Mine have literally withstood toddler torture to be a part of many summer memories! 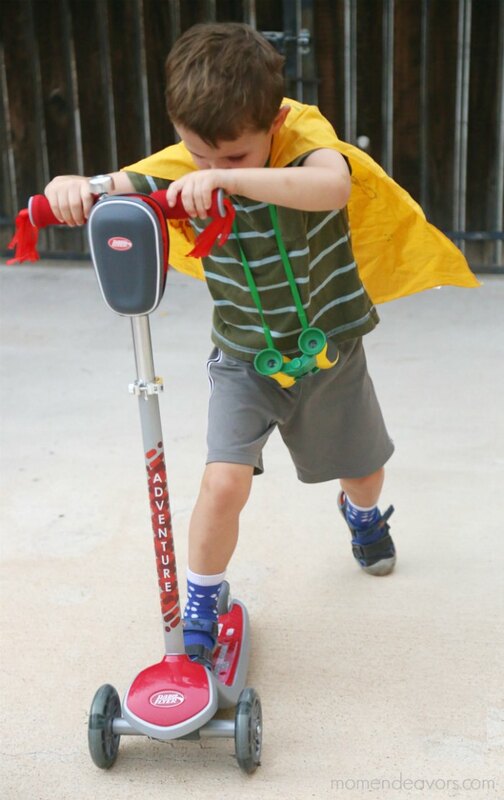 I agree with you when you say that build a scooter is amazing with the customization option and the lighting up of wheels is bound to be a great hit with younger riders!! But my fav radio flyer has always been the TESLA! It’s so stylish and looks like so much fun! I like the Pathfinder Wagon! I really like the radio flyer cyclone and inchworm. My favorite product is the DELUXE GRANDSTAND WAGON 3-IN-1™. Love My First Big Flyer with lights and sounds! I really like Luke Skywalker’s Land Speeder. STARTS AT $115 is such a fun option!! I like the Ultimate Family Wagon. The Deluxe Grandstand Wagon 3-in-1. I love the 4-IN-1 STROLL ‘N TRIKE®. I like the wagons, like the 3-IN-1 EZ FOLD WAGON™ WITH CANOPY. I like the scooters. Its really neat how you can customize them now. I noticed each product was now customizable and my kids would love that. I Really liked the Luke Skywalker’s Landspeeder…very cool! But not in my budget right now. Also liked the scooters, they seem very well made. Thanks! I like the BUILD-A-HORSE from Radio Flyer. I really like the 4-IN-1 STROLL ‘N TRIKE. My daughter would love it! I like the Town and Country wagon: 100th anniversary edition. It’s so cute and it’s a classic. The flyer 500! My kids would love the little coaster! I love the Luke Skywalker Landspeeder! I like the Deluxe Grandstand Wagon 3-in-1. I like the Triple Play Wagon the most of all of the really fine Radio Flyer products on the website.